Stitch a clowder of cute felines! 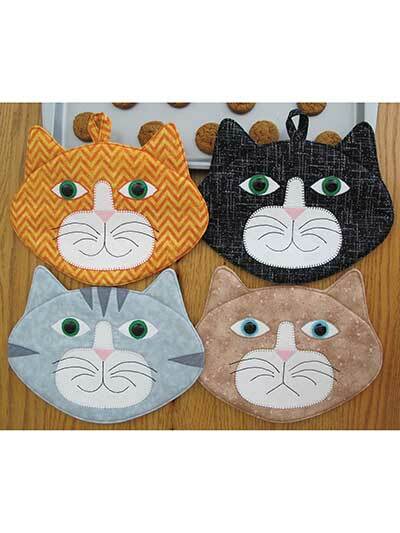 Give your kitchen decor some added fun and color with these adorable hot pads! This pattern is great for stitching up a gift for the cat lover in your life or just for making something special for yourself. 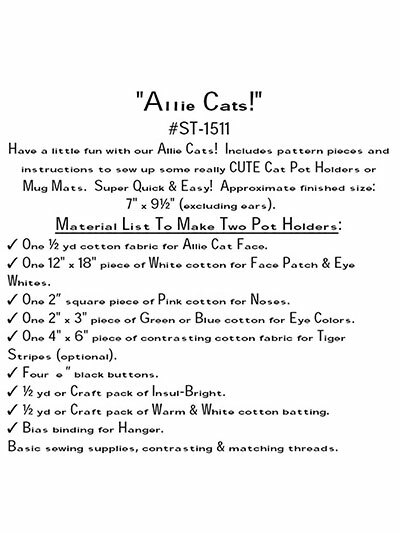 The pattern includes all the pattern pieces and instructions to sew up hot pads or mug rugs that will really be the cat's meow! Finished size is 7" x 9 1/2" each, excluding ears. This is a fun project to make for yourself or as a gift. Love it! So adorable. Big hit for gifts. Very cute, but pattern verbiage is very hard to figure out and I have been sewing since I was 5. Someone needs to test it out and make some additions. This pattern is really cute. It is very well written. The instructions are easy to read and follow. I'm excited about completing this project. I just got started. I might update this evaluation when I finish these. These are the cutest, I also improvised and made matching placemats and drink coasters, you will love this pattern, very fun to make. Thank you Annie's.